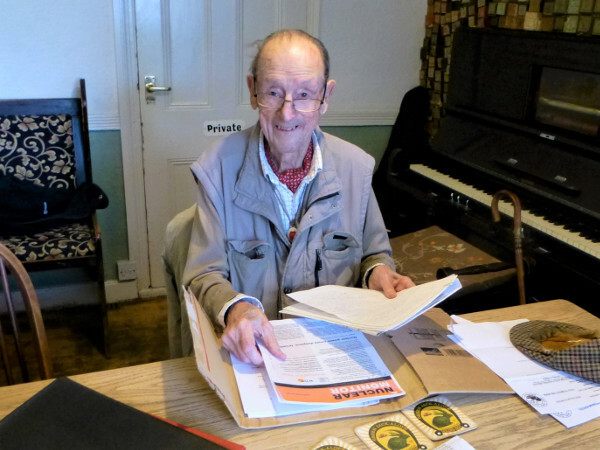 Charles Barnett, Chairman of the Shut Down Sizewell Campaign has died after a short illness at the age of ninety-three years of age. Charles founded the Campaign over thirty years ago, and was its Chairman taking his last meeting in July 2018. He died peacefully at Ipswich Hospital on 10th August.. The Campaign has hundreds of members both in the UK and overseas. Charles was a lifetime member of the ‘Campaign for Nuclear Disarmament’ and he believed strongly that nuclear power is an unsafe and unnecessary source of energy. Over many years, he took part in campaigning, lobbying Parliament, letter writing, and protests, and was an ardent advocate to end nuclear energy at the Sizewell site in Suffolk. He characteristically led the Campaign with both determination and passion to the very end of his life, and he remained aware of all the current issues and developments within the nuclear industry. Mr Barnett leaves a family of three sons Michael, Lawrence and Robert, nine grandchildren and six great grandchildren. The funeral will be at 1.00 p.m. at the Greenwood Burial Ground in Saxmundham on Thursday 16th August.